Between yesterday and this morning, I received the same award three times. I pretty much stopped posting tags and awards on here long ago, but thought it was funny that I just got the same one back-to-back. So thanks so much Jessica, Kay and JaelCustomDesigns! If I never posted yours it doesn't mean I didn't appreciate it. It just means I haven't had the time to think of Ten Facts You Don't Know About Me, Things I Like with the Letter J, Shuffled iPod Song Titles that Best Describe My Life or 200 bloggers I'd tag. well hello dear friend. i just wanted to come by and thank you for my daily smile. im sorry i have not commented- but i am stoping by to read all the amazing things you post. thanks for all your sweet comments. ill do better and comment more! Well congrats for being recognized even if you *can't* think of things to share with us. ;) You actually working today? What fun! Congrats on your awards. I can see why you got 3 because I always enjoy reading what you have to say! Love your blog. Thanks all! And tooj, yes, I finally went into work this afternoon. Did a bunch of unpacking and trying to unclutter but it's still a mess over there. 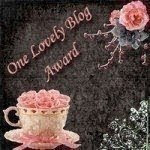 :) Great blog - wonderful author - well deserved award. Congrats! Dontcha just love when several come in all at once?